A dangerous receiver for tiny Ball State, Ridgeway set school records for receptions (105) and yards (1,399) in a season. Dante finished with 238 receptions, for 3,030 yards, and 22 touchdowns in a mere 35 games. He elected to forgo his senior season and enter the NFL draft in 2005. Despite running a blazing 4.36 40, at 5’11”, 212 he was considered a bit undersized. Also playing in the MAC didn’t earn him any points with scouts. The St. Louis Rams pulled the trigger on Ridgeway during the 6th round. 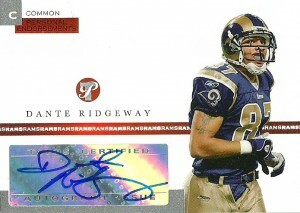 Inexplicably, a month after signing a 3 year contract with the Rams, the team would cut Dante in August of 2005. A short stint on the Bengals landed Ridgeway on the roster of the Jets, from 05 to 06, and then the Saints from 06 to 07. After joining again the off-season roster of the Jets in 2007- Dante returned to the Saints from 2007-2008. He’d contribute primarily as a special teamer, or rarely suit up. 2009 led Ridgeway to the Peoria Pirates of the AFL, and then quickly to the Chicago Rush in 2010. Topps never seems to top itself, creating some of the worst cards on the market. Even their autograph cards are foul. Who creates an autograph card and then puts the word ‘Common’ on it?